Business Card Designer Software lets you design your own professional corporate cards (a.k.a. commercial Visiting card) easily with different folds. 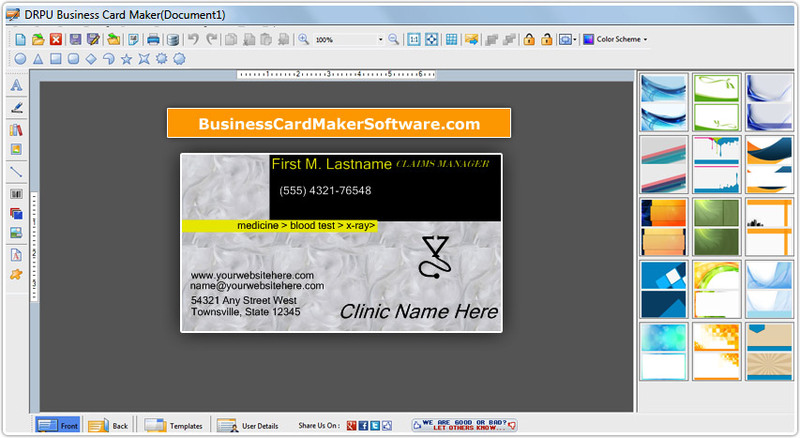 The program interface is attractive and user can start making their business cards even when using for first time. Simply drag and drop the various available image editing tools in the Business card designing area to generate business cards in simplified way. Click here to Know about How to design Business cards? ✔ Design and create business cards using image designing tools including Line, Ellipse, Pencil, Rectangle, Barcode, Text, Picture, Arc, Triangle, Star and other objects. ✔ Customize the width and height of your Business card to suit your requirements. ✔ Customize with addition to include logo, images, text and symbol to create stunning business cards. ✔ Option to create folded business card if required. ✔ Design business card in variety of shapes including CD shape, DVD shape, Rectangle, Rounded Rectangle, Ellipse and more. ✔ Design the text with use of advance WordArt text-styling feature set. ✔ Specify the color and background settings of business card including Solid Color, Gradient, Image and Style settings. ✔ Provide option to print designed business cards with flexible print settings. ✔ Easily include message using message templates during business card designing process. ✔ Select image from library during business card designing process. ✔ Data Set Series feature allows to generate the multiple copies of business cards with different barcode and text value.